Harlan Orrin worked for Rayson Craft in the early '60's building their wood decks and sends me some great information for the site. He says during the three years he worked there they built 2 wood decks a week. There are a lot of historical pictures from him on the Photos page. This page is where I'll post some of the other stuff he sends! Harlan's contact information can be found at the bottom of this page and on the Resources page - He still builds and restores boats and decks. 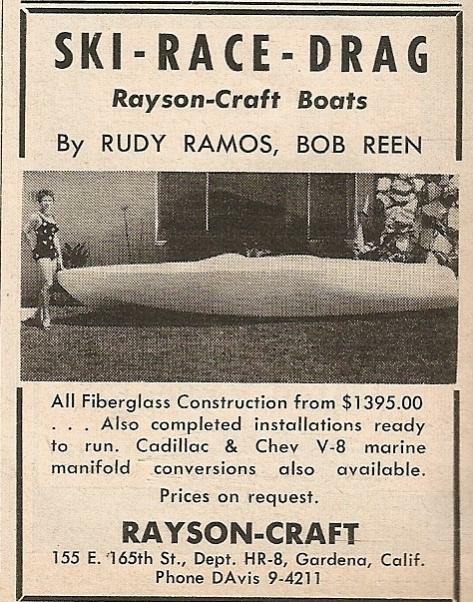 Be sure to look for some of his boats and projects on the Rayson-Crafts for sale page if you're looking to own a piece of history! 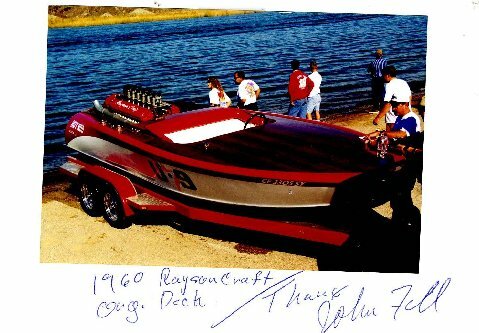 While I worked for Rayson Craft in 1962 I built the only wood Rayson Craft. It was a 19' ski hydro. The sponsons were under the boat. It was built for Stephans Mens Products in Florida. 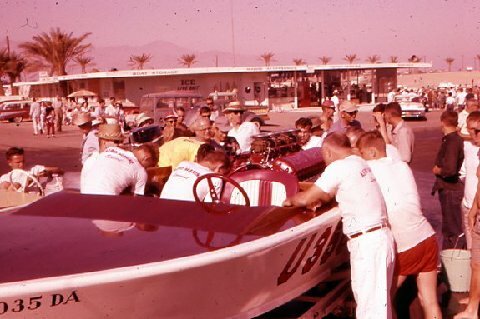 The boat ran at the Salton sea endurance race. 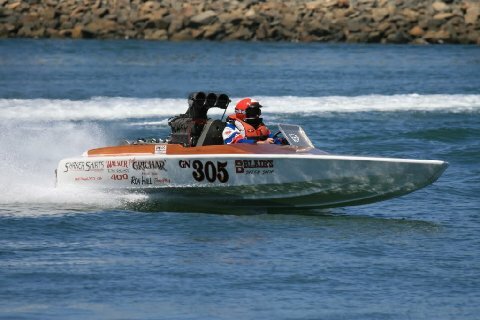 It won the Gold Coast 250 mi enduro and raced as U E - 99. The boat was white with a wood deck. Maybe some of the Florida boaters may know of this one of a kind boat. 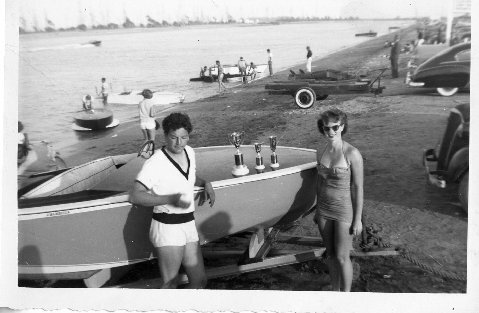 Bob Reen built GOLDDIGGER BOATS. 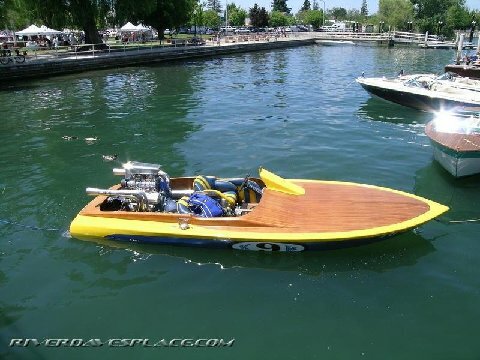 He worked with Rudy Ramos to build the mold from Claire Newton's 18' wood Joe Mandella boat. The boat in the add was on the lawn in front of the RAYSON CASTINGS office. The model is Rudy Ramos wife, Frankie. Rudy Ramos and Frankie, before marriage, in front of his first wood Mandella. 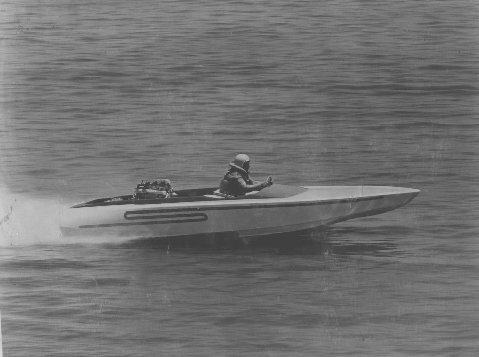 The 16’ plywood, flat bottom, v-drive boat, was built by Joe Mandella in 1950. It was powered by the Flat Head Ford from Rudy’s track roadster. The picture above is from 1950. This boat is a production 19’ monkey pod wood decker. 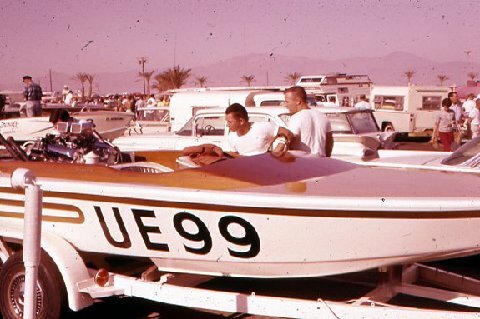 This boat was first offered in 1960. 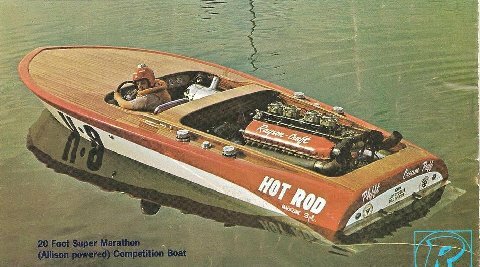 K 9 M Rudy Ramos’ Gold Coast Marathon winner in 1972, was originally powered by a H&M SOHC Ford. 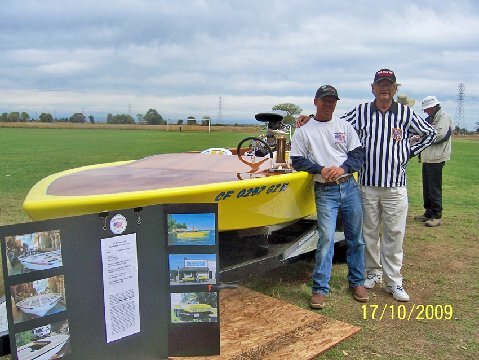 The boat has been restored and is owned by Gene Dangle. It is now powered by a blown BBC, pictured here in 2008. This wood deck 16’ Rayson Craft has been restored by owner Manny Dolim, with a wood deck by Harlan Orrin. GN 305 19’ restored several years ago and currently racing. Picture 2009. Rudy and the HOT ROD MAGAZINE SPECIAL with 4 4bbl. carbs, later changed to 6 Webbers. (see first picture of this boat above.) This picture is from 1960. U 350 AERO MARINE SPECIAL 1961 Salton sea 500. w/Allison aircraft engine circa 1960.